﻿ KCR Studied M Sc (Political Science) How & When? KCR Studied M Sc (Political Science) How & When? As the election fever is gripping Telangana, Political Parties have been retrieving old videos to expose the true colors of Opponents. 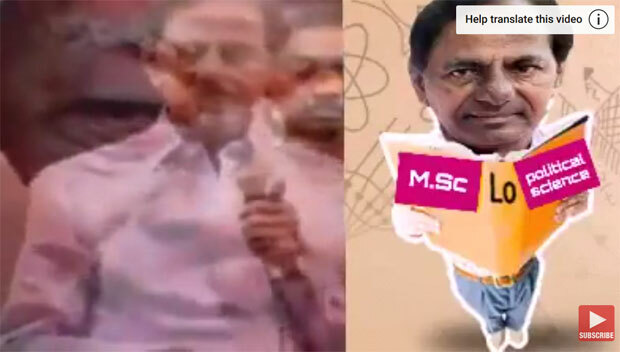 An video of KCR claiming to have studied M Sc (Masters in Science) in Political Science at the condolence meeting of Former Union Minister G Venkat Swamy went viral. Actually, KCR has done Masters in Telugu Literature and that's something he proudly claimed a lot of times. Be it in his election affidavits or government records, He did mention about pursuing MA Telugu. So, When did he complete Masters in Political Science is a mystery. In fact, There is no course like M Sc (Political Science) in any universities in AP and Telangana. While M Sc is related to Science, Political Science is an Arts Subject. Courses such as M Sc (Political Science) are taught only in the Foreign Universities. It can be understood that what happened with KCR is a slip of the tongue moment...something similar to Physics in B Com! Other claim of KCR that he had read 80,000 books is being proven wrong by his Political Rivals. Reading a book takes not less than 4 hours, so an individual can't read more than 1,000 books per year even if he doesn't indulge in any other activities. At the age of 64, How could KCR complete reading 80,000 books? Did Pawan Copy Mahesh's Dialogue? TDP...It's Only A Trailer...Picture Abhi Baaki hain! !